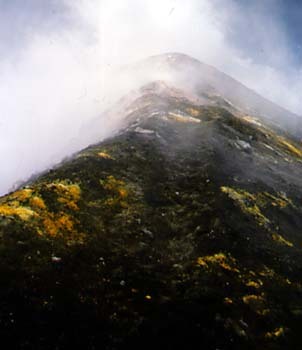 Highly active Pacaya Volcano is the most frequently climbed volcano in Guatemala. It is relatively easily accessible and commonly puts on a good show for volcano enthusiasts. 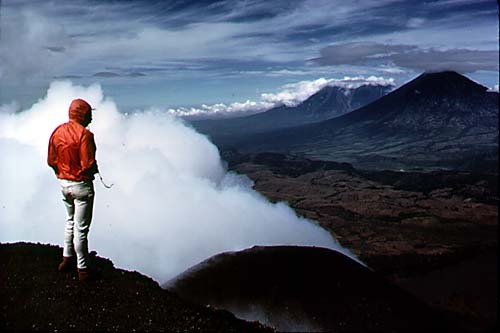 The paragraphs and accompanying photos on this webpage will give you an introduction to the volcano, its many types of activity over the years 1970-2001, and hints on how to visit it safely. 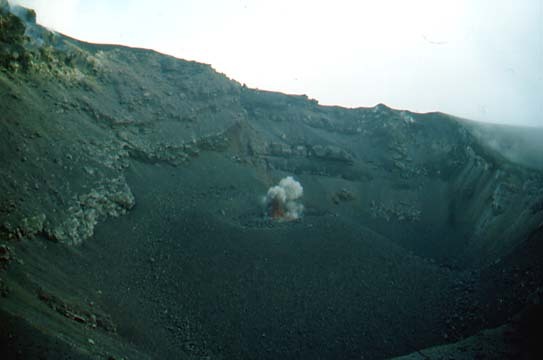 Pacaya's current active phase began in 1965, and the volcano has been almost constantly in eruption since then. Eruptive activity ranges from minor gaseous emissions and quiet steam eruptions, to explosions powerful enough to hurl bombs up to 12 kilometers and necessitate the evacuation of numerous villages on the flanks of the volcano. 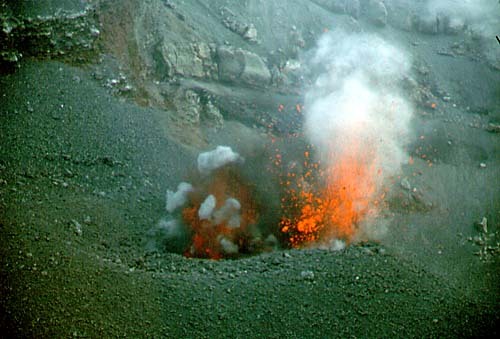 Eruptions also include strombolian activity such as shown above, vulcanian explosions, minor flows from the crater, and larger flows emitted as flank eruptions. 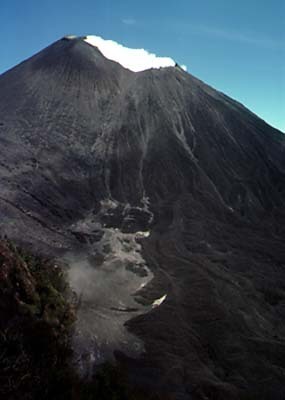 Pacaya is the active vent in the Cerro Grande-Pacaya-Cerro Chino volcanic complex. It sits at the south end of the Guatemala City graben, a down-dropped fault block that forms the north-south valley in which Guatemala City lies. The volcanic complex may be related to the normal fault system defining the east side of the graben. 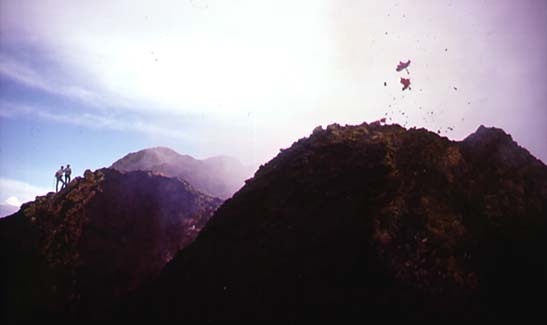 Here smoking Pacaya is viewed from the highway to Antigua, which climbs the western graben wall. Photographed 8/86. 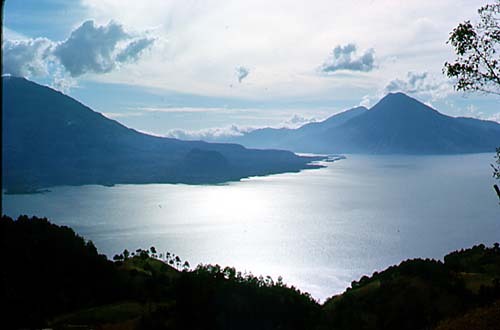 Immediately to the north of the complex lies Lake Amatitlán, occupying part of a caldera collapse structure. A small part of the lake can be made out along the lower edge of this photo, Pacaya from the air, taken 11/72, with the volcanic complex dominating the skyline. The easiest and most secure way to visit Pacaya is to go with a licensed tour operator, of which there are numerous in Antigua taking groups to visit Pacaya every day for around $15 per person. Not a bad deal. Of all these operators, we recommend most highly Sergio Garcia of Eco-Tour Chejo's (contact information at the end of this webpage). Or, if you have your own transportation and an adventurous spirit, you can go on your own. To reach Pacaya, head south from Guatemala City, on the highway to Esquintla, but turn off on the road to the town of San Vicente Pacaya and Pacaya Volcano National Park before reaching the town of Palín. Watch carefully for the sign...it's not very prominent. The road up the mountain to San Vicente was paved in 2001. But from where the entrada to San Vicente forks off down to the left the road continuing straight on up through the village of Cedros to the hamlet of San Francisco de Sales and Pacaya Volcano is dirt. It is rough, but passable all year round, unless blocked by a landslide or mudflow. 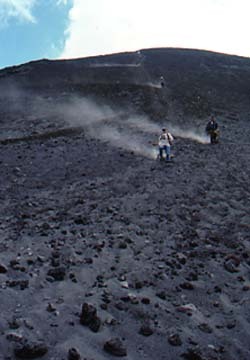 There are two trails up Pacaya Volcano. The more gentle trail, followed by most of the tour groups from Antigua, starts at San Francisco de Sales. Here is the official entrance to the park, and where you need to stop to pay admission (Q25 for foreign visitors in 2001). The trail from here is well maintained, with rest stops, trash receptacles and restrooms (primitive), and is patrolled by guardabosques (rangers). There is safe parking for your vehicle here in San Francisco, and you can also buy refreshments here, which are highly appreciated when you get back. The second trail, which starts from the complex of radio towers on the flank of Cerro Chino, is a bit tougher, but perhaps more rewarding for geology and photogenic views. This is the trail described in this website. If you decide to follow this trail, you should still check in at the park headquarters in San Francisco de Sales and pay your admission. You should also be aware that this trip is not patrolled by the guardabosques; there have been some robberies on this trail in past years, and cars parked below the radio towers have been broken into. If you choose this trail, you should hire a local kid to watch your car while you are gone. To hike this trail, pay your admission in San Francisco, then drive back down the road to the first left hand fork. This takes you to the base of the steep climb up to the radio towers. Most non-4WD vehicles can't make this climb because the ash on the road is so loose, so plan to park down below at about 1895 m (6215 ft), leave your car with a boy to watch it, and hike on up the road to the radio tower cluster. When you run out of road you're not far from the ridgecrest, so just follow an uphill trail and keep on huffin' and puffin' your way up the steep climb to pop out on the rim of the old Cerro Chino crater, at about 2265 m (7430 ft). Here you have a good place to take a rest break and a terrific view of Pacaya cone. Photo 8/86. The trail continues to the left along this rim, gradually climbing and circling around to the base of the Pacaya cone. Along the way a geologic cross-section, can be seen in the cliffs below the Cerro Chino rim, revealing the interlayering of flows and pyroclastic deposits characteristic of a composite volcano. 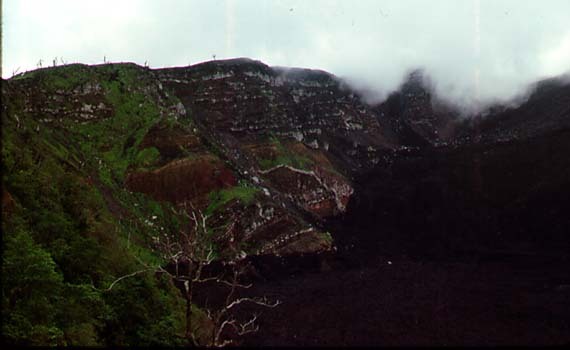 In the photo taken 6/89, the flows show up as lighter layers, and the ashy pyroclastic deposits as darker layers. 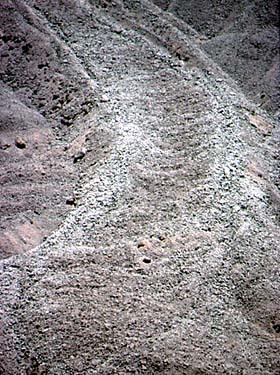 A dike can be seen in the center of the photo, cutting diagonally across the layers. Below the rim trail, the ancient Cerro Chino crater is partially filled with recent flows, such as seen in this 3/78 photo. 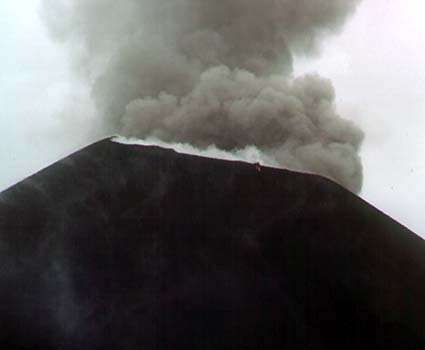 Note that at this time, Pacaya was in a quiet steam eruption. On the flows below the Cerro Chino rim, if your screen image is large enough, you may see a tiny light blue spot on a flow lobe in the lower center part of this shot; that's a geology major from Tennessee Technological University, to give you a scale. In this 8/92 telephoto shot, a flow with pressure ridges and lava levees can be seen. As you continue around the Cerro Chino rim, the main trail from the park entrance joins from the left. You will see an information sign near this trail junction. 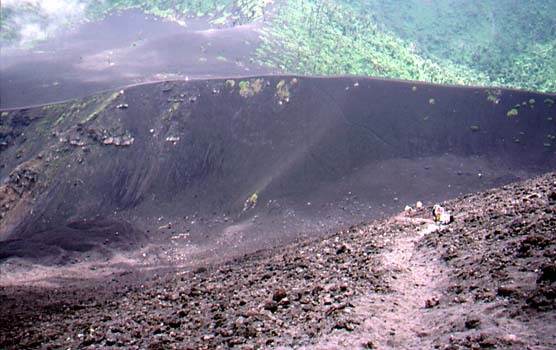 The rim trail brings you to the base of Pacaya's cone, where the final steep ascent begins. This 8/92 photo looks down on the end of the rim trail. The final climb is only about 150 m (500 ft), but is a real huffer-puffer. With each step in the loose ash and scoria you gain a bit, and slide back a bit. Just before reaching the summit, the trail turns back to the left towards the old summit. To the right is the currently active vent. If there is any explosive activity, it is best to continue to the old peak first. After observing the activity from the old peak for a while a judgment can be made as to whether or not you want to approach the active vent. The published elevation is 2560 m (8400 ft), but of course it varies from year to year, according to the building and destroying volcanic processes. The view from the peak is magnificent! At the time of this 11/70 shot you could look down on the active vent, which blew off in small steam explosions, throwing small bombs straight up into the air perhaps 100 m. To the northwest, the soaring cone of the extinct stratovolcano Agua (3760 m/12,335 ft) can be seen. 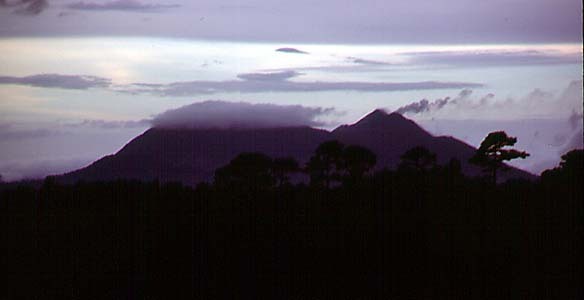 Beyond Agua is the double cone of Volcanes Fuego and Acatenango, partially covered by clouds. Fuego (3763 m/12,345 ft), on the left, is historically the most active and dangerous of the major cones in Guatemala. Acatenango (3975 m/13,040 ft) still has some active fumaroles at its peak and is certainly not extinct yet. In March 1978, the old crater still existed, but was in the process of being destroyed. The photo shows a small bluff line running across the righthand wall of crater: this is a fault scarp. 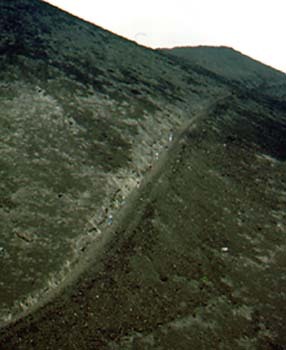 In 1978, most of the old summit crater was bit-by-bit slipping down towards the new vent. The cone that has been built up, destroyed, and rebuilt several times since 1965 is known as the McKenney Cone, after Dr. Alfredo McKenney, of Guatemala City. 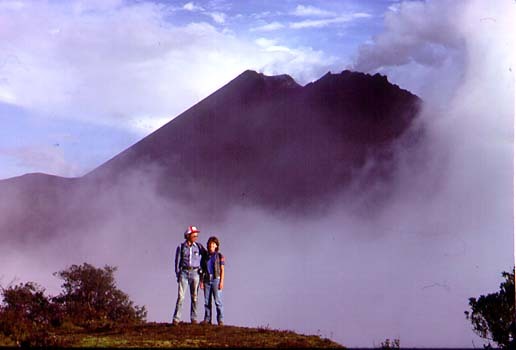 Don Alfredo has climbed the volcano literally hundreds of times, and has compiled a magnificent photographic record of the modern phase of activity at Pacaya. In August 1986, activity at the McKenney cone crater consisted of spatter cones sporadically lobbing small blobs of molten lava into view. In January 1987 a powerful explosion hurled boulders and bombs up to 12 km, damaging homes in nearby villages. 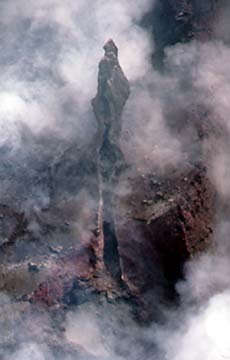 In June 1987, small flows were streaming down the flank of the cone; the alignment of the flows indicates that they were issuing from a fissure. 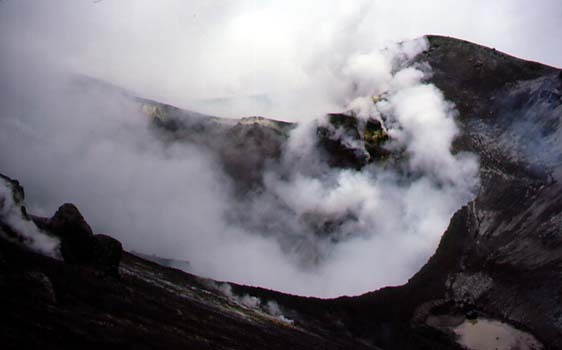 In June 1988 the active vent was higher and larger than in August '86, with small-scale vulcanian activity sending up roiling ashy clouds, and making "chuffing" noises. The cone was approachable, but not with total safety; in this photo, the person descending from the rim of the cone is doing so in haste, fleeing the rain of ash and hot rocks from an unexpectly strong "chuff". In addition to the possibility of being hit by a falling bomb during explosive eruptions, visitors to the rim must also be cautious about volcanic gases. Here yellow sulfur sublimates on the rim trail attest to the sulfurous gases pouring over the crater rim. When inhaled, sulfur dioxide combines with water in the lungs to form sulfuric acid. The burning sensation is very unpleasant, and high doses could be harmful. Becoming trapped in a cloud of sulfurous gases could be fatal. It is best to stay on the up-wind side of the vent, where you can drop down below the rim when blasts of sulfurous gases swirl your way. Also, keep an eye out for a quick retreat route if the wind direction shifts and more than just a momentary swirl of noxious gases heads your way. 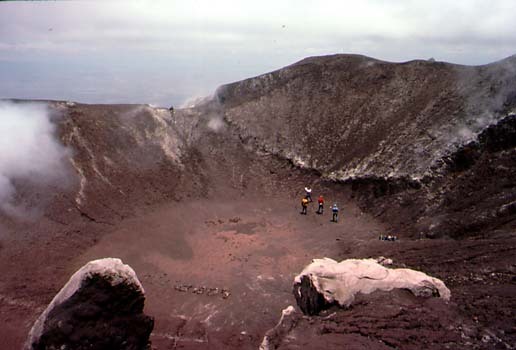 By June 1989 the previous year's summit cone had collapsed, and a double crater in the shape of a figure-8 had taken its place. The white clouds are steam, but near the right edge of the photo a bluish cloud can be seen, which is sulfurous and to be avoided. Within the nearer of the twin craters rose a bizarre chimney of congealed lava. This double crater still existed in March 1990, but the near crater had become largely filled in. Nonetheless, it was still the site of small explosive activity, and a real fun show. 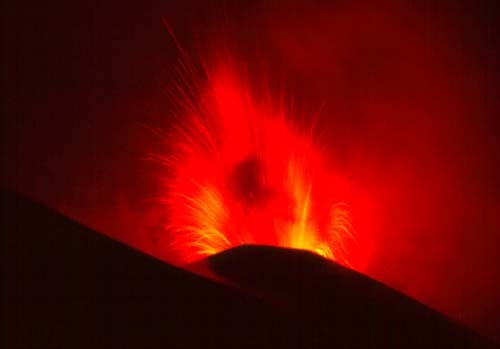 Of course, strombolian explosions are most spectacular when viewed at night, as shown in this shot of volcanic fireworks taken from the Cerro Chino rim, May 1994. The opening photo for this page was taken at the same time. What goes up, like volcanic bombs, must come down. And the same is true of volcano watchers. The safe way back down from the peak is to follow the same trail used to ascend. But the fun way is to "ash ski" down the straight shot trail from the old summit, as these volcano fans were doing in Aug. 1996. But have a care! A tumble on this slope would result in multiple abrasions, if not in broken bones. If you plan to climb Pacaya, you need to allow all day for the trip. The climb up generally takes 2-3 hours. It is non-technical, but tiring and you'll feel the elevation. The weather is generally better in the morning than in the afternoon when clouds and rain are more likely. 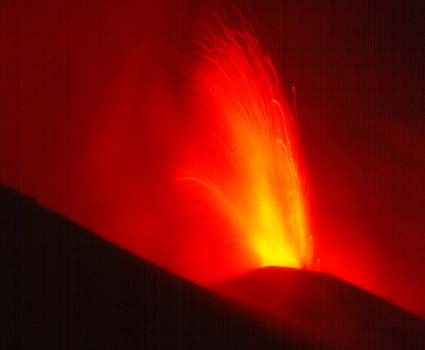 However, if the volcano is in a phase of strombolian eruptions or active flows, nighttime views can be incredible. You need good advance information, and you should go with a guide, for safety reasons explained below. If you are not traveling with an organized tour out of Antigua, you should definitely hire a local guide to accompany you. And no vehicle should be left unguarded. There have been incidents of robbery and assault on the mountain over the years, and parked vehicles have been looted. It may not be safe to climb the volcano independently. 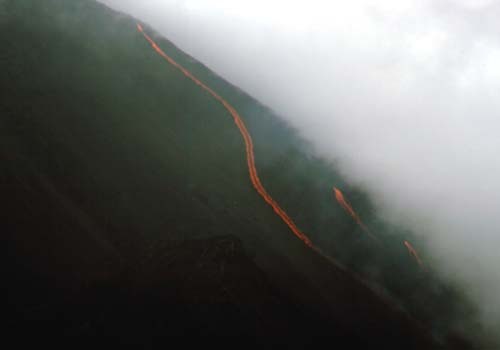 Information as to current volcanic activity and any recent security problems on Pacaya can be obtained from the INGUAT office on the Plaza de Armas in Antigua and from various tour agencies in Antigua offering trips to Pacaya. What you need for the hike: Good boots that lace up (low cut shoes and tennis shoes fail to provide ankle support and also let volcanic grit get into your socks, which can be pretty uncomfortable); canteen of water; snacks; sunblock and dark glasses; a hat that won't blow off (one with a chin strap would be good); rain poncho just in case of bad weather; jacket and long pants if you plan to be on the mountain at night; camera and film; maybe about Q50-- Q25 for the park entrance fee and little extra for refreshments when you get back down. It is not recommended that you bring unnecessary cash, jewelry, expensive watches (windblown volcanic grit can be hard on watches). PACAYA UPDATE, June, 2001: Volcán Pacaya has been made a national park. A visitor's center/ticket booth has been constructed at San Francisco de Sales and is being provided with displays; there are restrooms here. A nice trail to the volcano has been opened, complete with rest areas, trash bins, and directional signs. There are even restrooms at one spot. And rangers have been hired to ensure visitor security. At the present time Pacaya seems free of the robberies and troubles of the past. Nonetheless, it is still recommended that visitors go with a guide. We recommend Sergio Garcia as a Pacaya guide par excellence. Sergio has a passion for Pacaya, having climbed the mountain over 1900 times (as of June 2001). He knows every nuance of the mountain and regularly leads groups up to see the action. Contact Sergio at Eco-Tour Chejo's in Antigua Guatemala. Address: 3a. Calle Poniente, No. 24; phones 832-5605 and 832-2657. 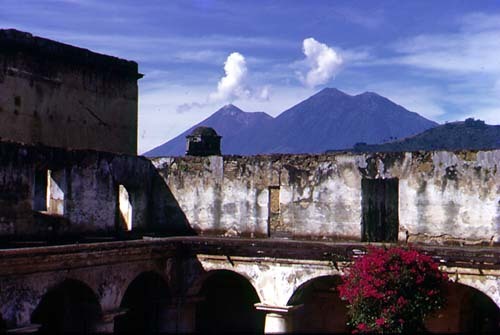 WOULD YOU LIKE TO CLIMB PACAYA AS JUST ONE OF MANY HIGH POINTS IN A SPECTACULAR GUATEMALA EXCURSION? If so, visit our homepage: Rutahsa Adventures to find out what amazing Guatemala trips we are currently offering. Most of our Guatemala excursions include a Pacaya climb, and all feature glorious views of the gigantic soaring cones of Agua, steaming Fuego with its twin, Acatenango dominating the skyline of Antigua, and Tolimán, Atitlán, and San Pedro towering over beautiful Lake Atitlán. 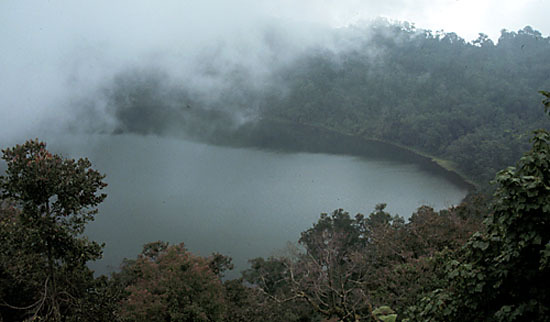 We sometimes visit the dramatic Santiaguito explosion crater, and the sacred crater lake at the extinct Chicabal volcano. Each trip is different, but all are enhanced by the majesty of Guatemala's volcanoes. Return to beginning of Pacaya page. Comments and enquiries can be sent to: rfinch@tntech.edu.